The research work in this project comprises three work-packages (WPs) addressing the objectives of the project. A schematic diagram showing the work packages of the project. WP1 – deals with modelling the non-linear behaviour of track elements using excitation models and is led by ISVR. 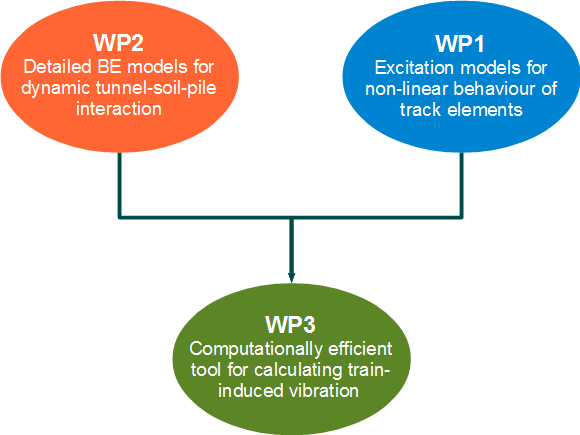 WP2 – develops detailed BE models to account for the dynamic interaction of tunnel-soil-pile and is led by DVRG. WP3 – is concerned with developing a computationally efficient tool for calculating vibration from trains and is led by ISVR.